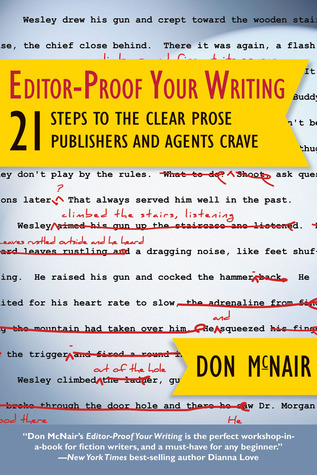 From Goodreads ~ Veteran editor Don McNair lays out an easy-to-follow and systematic method for clearing up foggy writing—writing that’s full of extra, misused, and overused words—in this guide to producing sparkling copy that attracts readers, agents, editors, and sales. McNair explains the common mistakes made by most writers and shows how eliminating unnecessary words strengthens action, shorten sentences, and makes writing crackle with life. Containing 21 simple, straightforward principles, Editor-Proof Your Writing teaches how to edit weak verb forms, strip away author intrusions, ban redundancies, eliminate foggy phrases, correct passive-voice sentences, slash misused and overused words, and fix other writing mistakes. A superb addition to any writer’s toolkit, this book will not only make writing clearer and more grammatical, it will also make it more concise, entertaining, and appealing to publishers. If you’ve never been published, there’s both bad news and good news. The bad news is that most unpublished writers will never be published. Editors receive hundreds of manuscripts each week and ultimately buy fewer than one percent. We’ve all heard of hapless writers who have wallpapered their home or office walls with rejections. Perhaps you’re one. The reason is basic. Many writers send problem-riddled manuscripts to editor after editor, as Barbara did, believing they are perfect. In the meantime they blithely build the same flaws into their next manuscript. They simply don’t know they’re making those mistakes. Unless someone tells them or they somehow learn on their own, their manuscripts will be rejected the rest of their lives. Note, however, that someone does recognize their problems. Those editors! They quickly spot them in a manuscript’s first chapter—often on the first page—and reject the submission without reading further. They know the rest of the manuscript contains the same mistakes, just as we know an iceberg’s submerged part is made up of more of the same ice seen on top. But editors simply don’t have the time or inclination to teach authors writing skills. So they send out “sorry, it’s not for us” letters and move on to the next manuscript in their bulging “in” baskets. Putting words in - hooking your audience, deciding on your point of view (POV), adding conflict, etc. Taking words out - using fewer "-ing" words and infinitives, shortening verbs, using active voice rather than a passive voice, etc. Each part goes into a lot detail with many examples. There are quizzes at the end of each chapter plus a story to correct to re-enforce the lessons of the chapter. I enjoyed this book and what I read will make me more conscious of my writing in general and the editing I do at work. Don McNair here. Thanks for hosting me today! I think this sounds like a very helpful book! :) Thanks for sharing your tips Mr. McNair!